Objective: The main objective of this study is to assess about the awareness, attitude, and practice regarding disinfection and handling of extracted teeth among the students of a dental college in Odisha, India. Materials and Methods: The survey was done with a self-designed questionnaire distributed among the students of a dental college in Odisha, India. Data analysis was done using the Statistical Package for the Social Sciences Software (SPSS for Windows, Version 16.0., Released 2007, Chicago, SPSS Inc.) and the results obtained. Results: Of the many methods available, the safest and practical methods to sterilize and disinfect the extracted human teeth could be autoclaving, submersion in 10% formalin and 5.25% sodium hypochlorite solutions. In addition, it was found that there is a significant need to educate the potential handlers of such extracted teeth about the latest statuary protocol and guidelines. Conclusion: Most of the participants in the study were aware of the established safety protocols regarding how to handle the pathogenic specimens and were putting in practice those standardized guidelines. But still another good number of handlers need to change their casual attitude while following the safety guidelines so as to protect themselves, others and the environment from the pathogenic clinical specimens. The survey was done by the close-ended questionnaire method after obtaining the needful Ethical Committee approval (KIMS/KIIT/IEC/83/2015). It consisted of 23 questions [Table 1]. The questionnaire was distributed at random among the 200 undergraduate and postgraduate students studying in a dental college at Bhubaneswar without any sexual predilection or bias [Table 2]. A pilot study was conducted with n = 20, before sample selection. The absolute precision was found to be 5% and the confidence level was attained to be 95%. The sample size was derived to be 200. Participation of the respondents was purely voluntarily with prior informed consent obtained. The questions included about general awareness, personal information, and attitude and awareness of handling the extracted teeth along with the sociodemographic aspects surrounding the concerned topic. Most appropriate answers as decided by the respondents were recorded and tabulated for statistical analysis. To score the knowledge and performance related questions, each correct response was given a score of one; each wrong response was given a score of two and no answer was given a score of zero [Table 3]. Other questions with many options were given a score of 1, 2, 3, 4, and 5, respectively. 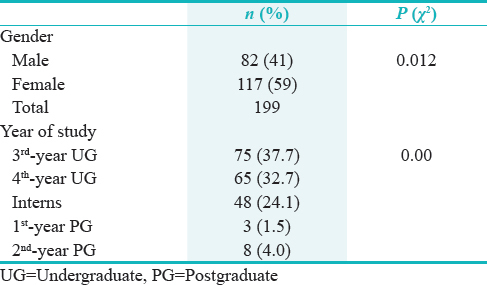 Of the 199 respondents, 82 (41%) were male and 117 (59%) were female (P = 0.012) [Table 2], [Table 4], and [Table 5]. Males take up stressful activities quite differently than the females. May be because of the hormonal built up and the ability to deal with the particular situation. Hence, error done under work pressure is less likely in males. 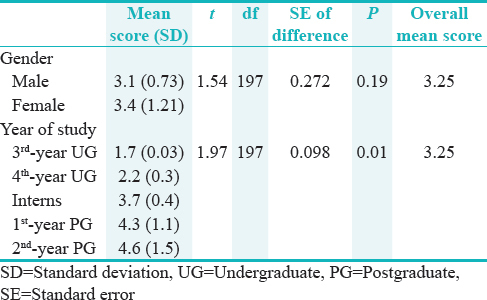 Among these, maximum respondents were 3rd-year undergraduates (37.7%) and the least were 1st-year Post Graduates (PGs) (1.5%) [Figure 1], [Table 2], [Table 4], and [Table 5]. About 57.4% of all respondents practiced their preclinical work on the extracted teeth, while the rest opted for other options. Between the typodont and the extracted teeth, the latter was preferred more (59.3%). Working on the extracted teeth helps in getting the same tactile sensation as like working in the real case scenario. Most of the teeth were collected from the institutions as more patients were referred to the bigger setups. A small percentage of the sample population (3.2%) had no knowledge that the extracted teeth could be potential source of infection, whereas 39.4% regarded extracted teeth as safe to work on. About 91% of the respondents could not recall any untoward incident happening with the use of extracted teeth which could be infected. Nearly 36.2% and 44.9% of the people were sure that the teeth may transmit hepatitis C virus (HCV) and HIV, respectively. Large number of respondents (83.3%) felt the need for statutory guidelines to handle the extracted teeth. Not many (80.2%) had kept themselves updated about the latest guidelines for safety. Many agreed to the need for wearing gloves, mouth masks, safe glasses, and apron while working and also while sterilizing the teeth. About 82.8% felt the need to preserve the teeth before putting it to preclinical use. Hydrogen peroxide was more commonly used chemical agent to disinfect or sterilize the teeth rather than chlorhexidine solution. Moscovich H, Creugers NH. The novel use of extracted teeth as a dental restorative material – The “natural inlay”. J Dent 1998;26:21-4. Inchingolo F, Tatullo M, Abenavoli FM, Marrelli M, Inchingolo AD, Gentile M, et al. Non-syndromic multiple supernumerary teeth in a family unit with a normal karyotype: Case report. Int J Med Sci 2010;7:378-84. Marrelli M, Tatullo M, Dipalma G, Inchingolo F. Oral infection by Staphylococcus aureus in patients affected by white sponge nevus: A description of two cases occurred in the same family. Int J Med Sci 2012;9:47-50. Tatullo M, Marrelli M, Scacco S, Lorusso M, Doria S, Sabatini R, et al. Relationship between oxidative stress and burning mouth syndrome in female patients: A scientific hypothesis. Eur Rev Med Pharmacol Sci 2012;16:1218-21. Inchingolo F, Tatullo M, Abenavoli FM, Marrelli M, Inchingolo AD, Palladino A, et al. Oral piercing and oral diseases: A short time retrospective study. Int J Med Sci 2011;8:649-52. Smitha D, Tijare MS, Amith HV, Gujjar KR, Sharma R. Knowledge, attitude and practice regarding handling of extracted human teeth among students of a dental college in Bhopal. J Indian Assoc Public Health Dent 2014;12:276-82. Occupational Safety and Health Administration. 29 CFR 1910.1200. Hazard communication. Fed Regist 1994;59:174-9. Deogade SC, Mantri SS, Saxena S, Sumathi K. Awareness and knowledge of undergraduate dental students about sterilization/disinfection methods of extracted human teeth. Ann Med Health Sci Res 2016;6:348-55. Attam K, Talwar S, Yadav S, Miglani S. Comparative analysis of the effect of autoclaving and 10% formalin storage on extracted teeth: A microleakage evaluation. J Conserv Dent 2009;12:26-30. Salem-Milani A, Zand V, Asghari-Jafarabadi M, Zakeri-Milani P, Banifatemeh A. The effect of protocol for disinfection of extracted teeth recommended by center for disease control (CDC) on microhardness of enamel and dentin. J Clin Exp Dent 2015;7:e552-6. Marrelli M, Gentile S, Palmieri F, Paduano F, Tatullo M. Correlation between surgeon's experience, surgery complexity and the alteration of stress-related physiological parameters. PLoS One 2014;9:e112444. Amith HV, D'Cruz AM. Attitude and practice on handling of extracted teeth for educational use among the students of a dental college in Southern India. Int J Med Dent 2014;4:73-9. Sandhu SV, Tiwari R, Bhullar RK, Bansal H, Bhandari R, Kakkar T, et al. Sterilization of extracted human teeth: A comparative analysis. J Oral Biol Craniofac Res 2012;2:170-5. Tabrizizadeh M, Abrisham M, Dehghan MF. Comparison of different techniques for disinfection of teeth internal space in preclinical teaching. J Dent Med 2009;22:120-4. Hashemipour MA, Mozafarinia R, Mirzadeh A, Aramon M, Nassab SA. Knowledge, attitudes, and performance of dental students in relation to sterilization/disinfection methods of extracted human teeth. Dent Res J (Isfahan) 2013;10:482-8. George SW, Pichardo MR, Bergeron BE, Jeansonne BG. The effect of formalin storage on the apical microleakage of obturated canals. J Endod 2006;32:869-71. Robinson C, Hallsworth AS, Shore RC, Kirkham J. Effect of surface zone deproteinisation on the access of mineral ions into subsurface carious lesions of human enamel. Caries Res 1990;24:226-30. Tatullo M, Simone GM, Tarullo F, Irlandese G, Vito D, Marrelli M, et al. Antioxidant and antitumor activity of a bioactive polyphenolic fraction isolated from the brewing process. Sci Rep 2016;6:36042.